For breast cancer detection, bi-annual MRI is better than annual mammography in high-risk women finds a new study. 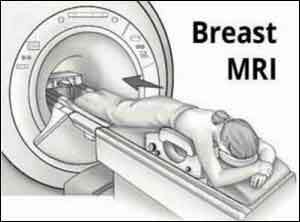 Undergoing magnetic resonance imaging (MRI) scans twice a year is more effective for early detection of breast cancer in young women with high genetic risk of the disease as compared to getting one annual mammogram, report the researchers. Results of the study were presented at the annual San Antonio Breast Cancer Symposium and simultaneously published in the journal Clinical Cancer Research. Rodrigo Santa Guindalini, Department of Radiology and Oncology, University of Sao Paulo Medical School, and colleagues conducted the study to establish a cohort of high-risk women undergoing intensive surveillance for breast cancer. For the study, the research team performed dynamic contrast-enhanced magnetic resonance imaging (MRI) every 6 months in conjunction with annual mammography (MG). Eligible participants had a cumulative lifetime breast cancer risk ≥ 20% and/or tested positive for a pathogenic mutation in a known breast cancer susceptibility gene. 295 women, including 157 mutation carriers (75 BRCA1, 61 BRCA2) were prospectively enrolled between 2004-2016. The mean age of the participants at entry was 43.3 years. Seventeen cancers were later diagnosed: four ductal carcinoma in situ (DCIS) and thirteen early-stage invasive breast cancers. Fifteen cancers occurred in mutation carriers (11 BRCA1, 3 BRCA2, 1 CDH1). No patients had lymph node metastasis at the time of diagnosis and no interval invasive cancers occurred. The sensitivity of bi-annual MRI alone was 88.2% and annual MG plus bi-annual MRI was 94.1%. The cancer detection rate of bi-annual MRI alone was 0.7% per 100 screening episodes, which is similar to the cancer detection rate of 0.7% per 100 screening episodes for annual MG plus bi-annual MRI. The number of recalls and biopsies needed to detect one cancer by bi-annual MRI were 2.8 and 1.7 in BRCA1 carriers, 12.0 and 8.0 in BRCA2 carriers, and 11.7 and 5.0 in non-BRCA1/2 carriers, respectively. The results suggest that for women with high-risk genetic mutations, intensive efforts to find small early cancers can be crucial to improving outcomes. “For these patients, annual mammography did not provide any additional benefit to bi-annual dynamic contrast-enhanced MRI scans,” the authors write. “Bi-annual MRI performed well for early detection of invasive breast cancer in genomically stratified high-risk women. No benefit was associated with annual MG screening plus bi-annual MRI screening,” concluded the authors.